Of Redwood City’s seventeen defined neighborhoods, the Centennial neighborhood is one of the easiest to delineate. 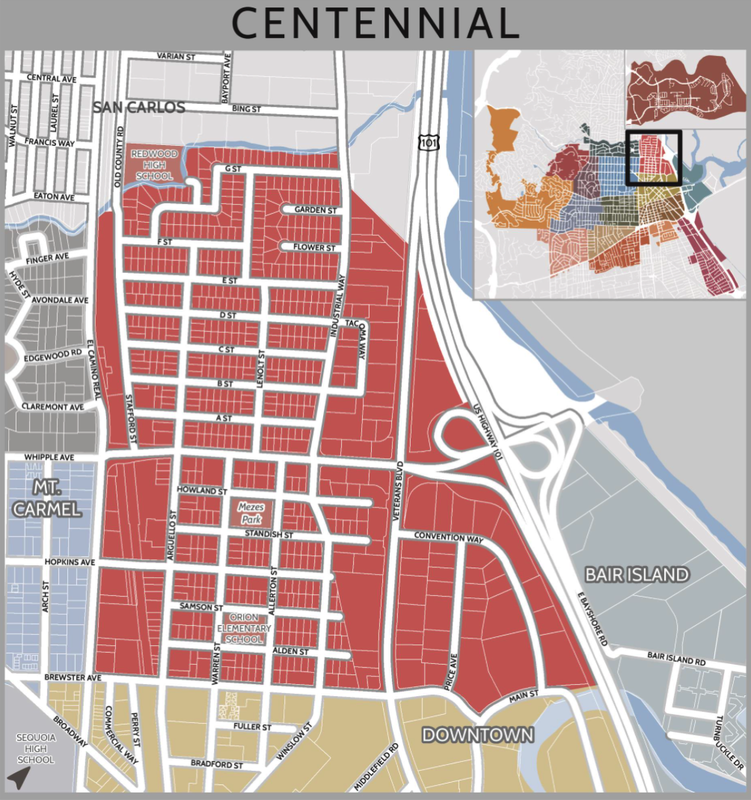 If you set aside Redwood Shores, Centennial marks the city’s northeast corner. In one direction the neighborhood stretches from El Camino Real to Highway 101. In the other direction it extends from Cordilleras Creek to Brewster Avenue (close to 101, Main Street defines the neighborhood). Looking at the above map, Whipple Avenue—which runs left-to-right through the middle of the neighborhood—and Veterans Boulevard—which begins as a southbound Highway 101 off-ramp and cuts straight down through the neighborhood—divide the neighborhood into two neat squares and a tall triangular portion. Except along their edges the two squares are composed almost entirely of quiet, attractive residential blocks. The triangular portion of the neighborhood, by contrast, is almost entirely composed of retail, offices, and light industrial businesses. Above Whipple are Redwood City’s “alphabet streets” (A through G) along with one of the exceptions to the rule that Cordilleras Creek serves as the city boundary: Redwood High School sits on property that largely squares off one corner of the neighborhood, property that is north of the creek and thus is on what would normally be thought of as San Carlos land. Even if you haven’t been through that portion of the neighborhood lately, you’ve surely noticed the activity that has been taking place at Redwood High School. The buildings under construction there are quite visible from El Camino Real. Part of the Sequoia Union High School District, Redwood is the district’s Continuation High School. It serves that portion of the student population who are considered to be at risk of not graduating from one of the district’s other schools. Students attending Redwood High must meet the same graduation requirements as those at the Sequoia district’s other schools, but Redwood has a more flexible schedule along with teaching methods that are tailored to better accommodate individual student needs. And, it has an on-site child care center for those students with children. There has been a school on this site for many years now, but thanks to Measure A—a Sequoia Union High School District bond issue approved by the voters back in June 2014—the campus is being transformed. From what I can tell Redwood High is getting a huge new main academic building (the orange-and-black building in the middle of the above photo) and, based on its size, a large auditorium or gym (the tall white building at the left in the above image). 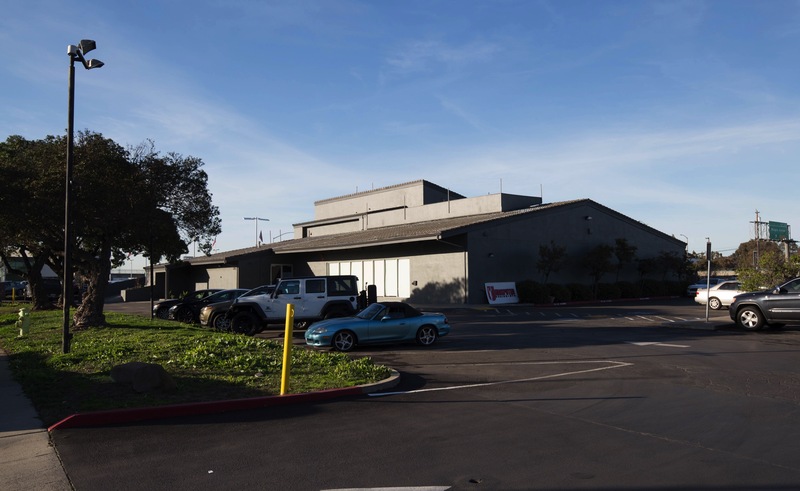 That auditorium (or gym), which sits on Old County Road, is what you cannot help but see when you drive up and down this portion of El Camino Real. Setting aside Redwood High School, the remainder of this part of the Centennial neighborhood is composed of mostly regular blocks of residential streets. The alphabet streets are lined almost exclusively with single-story ranch-style houses with one-car garages. The streets are comfortably wide, with plenty of mature trees in the parking strip. Because the streets in this part of the neighborhood are not through streets, traffic is almost entirely limited to vehicles going to and from the area’s homes. That makes the “alphabet streets” a most pleasant place to live, where the only intrusion is some white noise from nearby Highway 101. In the above picture, which shows some of the homes along G Street, you can just see a multi-story office building looming in the background. That building is across Industrial Way, and is actually within the city of San Carlos. Its address is on “Circle Star Way” and occupies part of the site that once housed the Circle Star Theatre—a subject I hope to address in a future post. But relevant for this post is the rather interesting fact that the office complex’s parking structure, shown below, apparently straddles the border between Redwood City and San Carlos: about half is in one city and half is in the other. 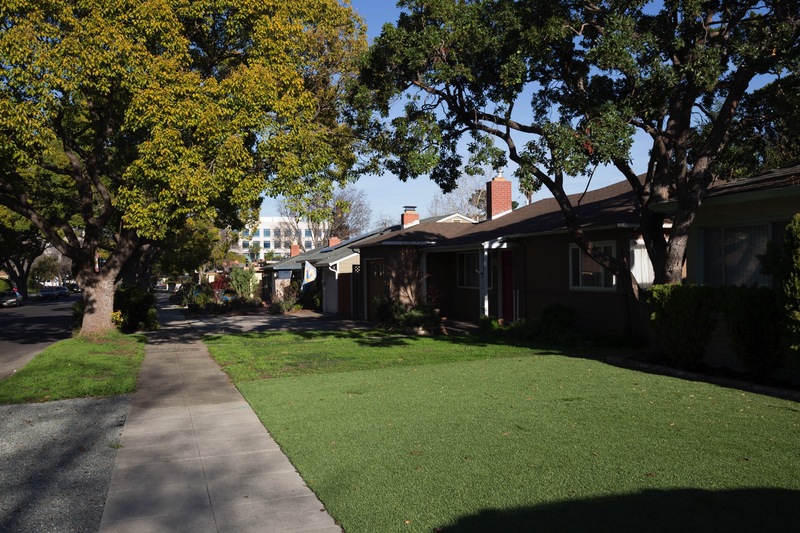 The lower square portion of the Centennial neighborhood, bounded by Whipple, Veterans, Brewster, and El Camino, is also largely residential. Here, however, you are more likely to find multi-family dwellings—apartments and condos—as well as a number of historic homes. So many historic homes, in fact, that a portion of the neighborhood has been designated by the city as the Mezesville Historic District. For those of you not up on Redwood City history, here is the relevant bit in a nutshell. Back in the early 1800s the Spanish government granted to Don José Dario Arguello some 69,000 acres of land, which he called Rancho de las Pulgas (today’s cities of Belmont, San Carlos, Redwood City, Menlo Park, and Woodside all are within the huge Rancho’s original boundary). After the Mexican-American War, property owners in California (including the Arguello family) had to go before a U.S. Land Commission to defend the titles to their land. The Arguellos hired Simon M. Mezes, an attorney, to establish a clear title to their land, which he did in 1853. As payment for his services, the Arguellos granted Mezes a portion of their land. He in turn platted what he termed “Mezesville” in 1854, and sold lots in the newly mapped town. Fortunately that name didn’t stick, and the new town eventually became known as Redwood City. Mezes’ original map for the town of Mezesville includes a great deal of today’s Centennial neighborhood. A portion of that neighborhood, very roughly from Brewster to one block shy of Whipple, and from Warren Street to Allerton Street, makes up the Mezesville Historic district (it isn’t that cleanly defined, but you get the idea). This district not only includes the homes in the area, but also the one park in the Centennial neighborhood: Mezes Park (the space for which Mezes set aside in his original map; he labeled it as “Park Square.”). 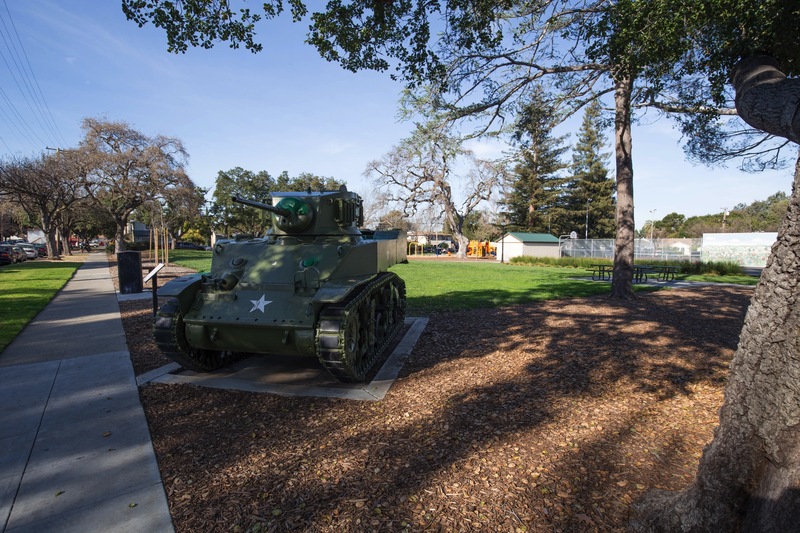 The Army tank, which was installed in the park in 1946 as a memorial to those who served in our two world wars, attracts children who love to climb on it. But this park has a lot more to offer. It has some great play equipment, which you can probably just make out in the center of the above picture. It also has a pair of tennis courts and a half basketball court, plus a large grass space (no sports fields, though), picnic tables, and restrooms. The park occupies an entire city block, and is 1-2/3 acres in size. Although the majority of the Centennial neighborhood is residential, as I noted earlier it also has a fairly large commercial presence. A portion of Veterans Boulevard, including the intersection of Veterans and Whipple Avenue, sits within the neighborhood, and so the Subaru dealership, the Good Nite Inn and IHOP restaurant, the McDonald’s, and the various gas stations clustered around that busy intersection all are part of the neighborhood. 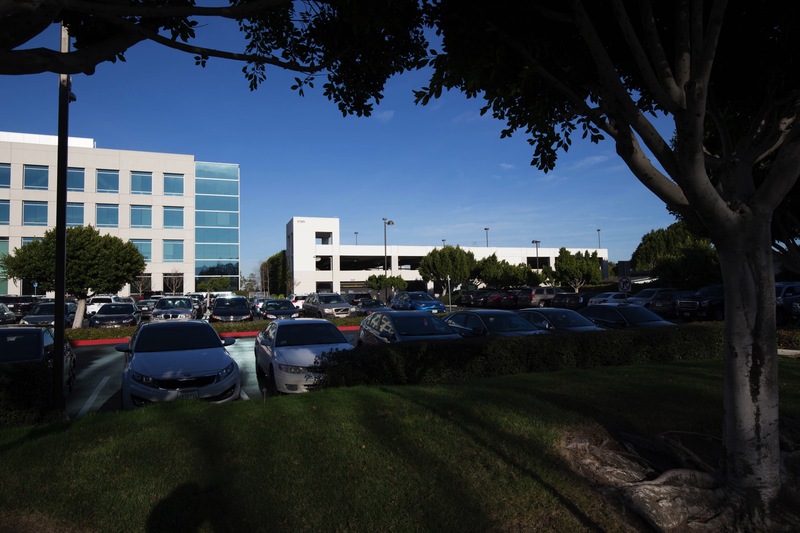 As well, Convention Way is entirely within the Centennial neighborhood, which means that Land Rover Redwood City (which also sells Jaguar cars), Putnam Lexus, and Peninsula Infiniti are all part of the neighborhood. As will likely be our new Tesla sales and service center, which is planned for the now-closed Crunch Gym site at the corner of Veterans and Whipple. 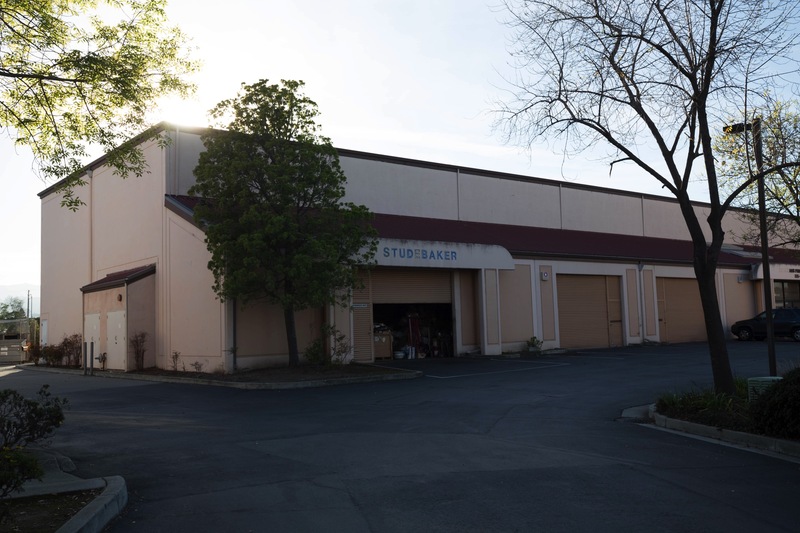 While I’m talking about this area, I should also note that Convention Way is where you will also find a nondescript automotive business of another sort: Studebakers West, at 335A Convention Way. This business, which has apparently been in operation for over 40 years, sells Studebaker car parts. Studebaker was a storied automotive manufacturer based in South Bend, Indiana who made internal-combustion-engined vehicles from 1904 until 1966 (and before that, they made wooden wagons). Clearly there aren’t too many of these vehicles still on the road, but for those that have one, Studebakers West appears to be a great source for parts. I did a bit of poking around on their website and found parts for cars from the 1930s through the 1960s. Across from Studebakers West, up against Highway 101, is the building that at one time was home to Redwood City’s Harley-Davidson motorcycle dealership. For some time now the building has been undergoing remodeling, and I can report that the new business at this location—Undisputed Boxing Gym—is now open. Undisputed, which moved to Redwood City from its former location on Industrial Road in San Carlos, is a fitness training gym whose workouts are based around boxing. When I was there this week the drab grey building was largely devoid of signage, but I expect that will change very soon. Lastly, I want to provide updates on two Redwood City businesses that are within the Centennial neighborhood. Both are on El Camino Real, and as it turns out they are adjacent to one another. First up, Honda Redwood City. 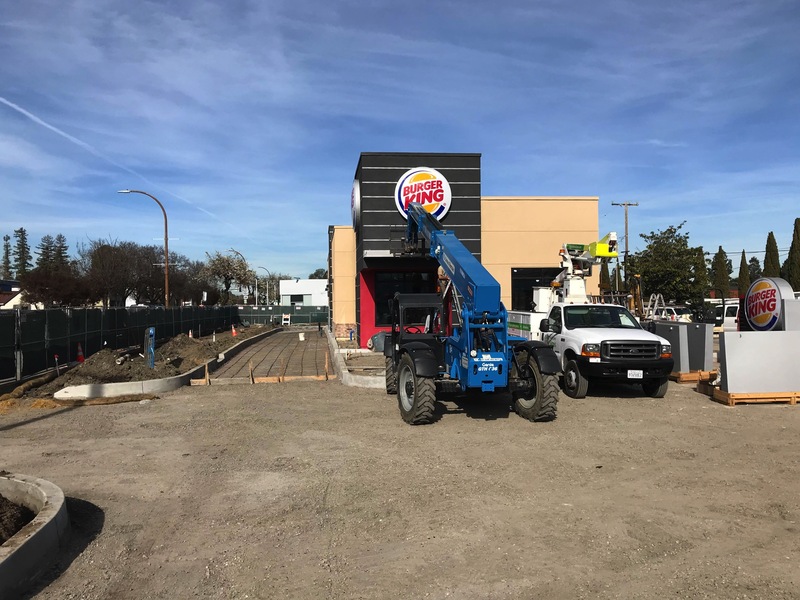 Their new location on Industrial Road in San Carlos, although behind schedule (they had hoped to open in late 2017), is progressing nicely now and will presumably open sometime in mid 2018. When that happens, the dealership at the corner of El Camino Real and Hopkins Avenue will close. A 33-unit condominium complex has been approved for the site, and I wouldn’t be surprised if the developer gets the project underway not long after Honda has made their move—perhaps sometime in the second half of this year. As you can see from the above picture, they seem ready to pour the concrete drive-thru. After that, the rest of the property will presumably be paved—which I’m pretty sure will complete the project. I wouldn’t be surprised if this Burger King reopens sometime this month. The Centennial neighborhood is a nice combination of homes and businesses, with a clear division between the residential and commercial portions of the neighborhood. So far the one significant development project from Redwood City’s current building boom that this neighborhood has had to endure was the construction of the 264-unit Radius apartments, at 620 Veterans Boulevard. For the most part, however, Centennial is a neighborhood that, to me anyway, exudes an air of peace and stability. It’s a lovely place in which to walk, and an interesting and important part of the jigsaw puzzle that is Redwood City. I don’t normally give a sneak peek into what will be next week’s blog post, but plans for what Greystar Development hopes will be its next Redwood City project just hit the city’s website, and, well, the project’s a doozy. 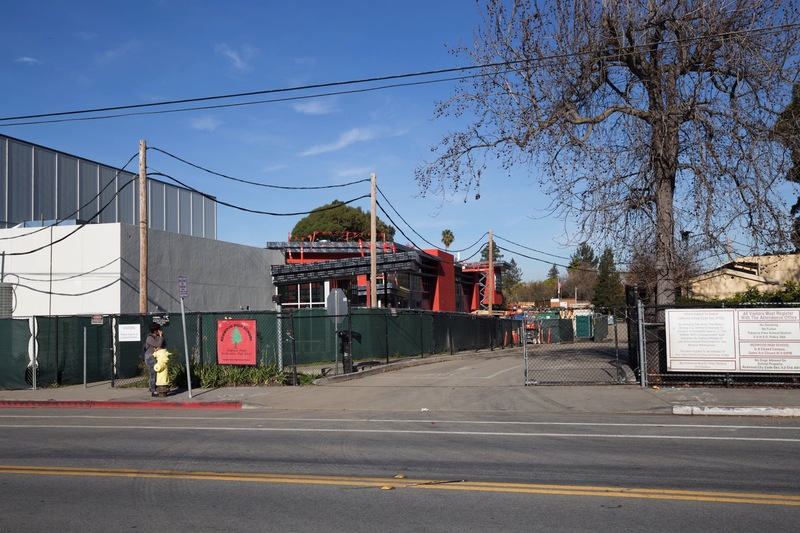 I plan to write about both it and the adjacent 1180 Main Street project in next week’s post, but if you are the type that just can’t wait, take a look at the 1601 El Camino Real project. Otherwise, keep an eye out for next week’s post, when I will go into both projects in some detail. What a neat park — I had no idea that was hidden within the neighborhood. Our 2.5yr old will love that tank…we may have to make a visit. Up until recently I was under the impression Putnam Jaguar still existed in RWC but apparently that’s not the case. At the moment the closest Jaguar dealer is San Jose as the dealer in Fremont also appears to have closed (or relocated to Livermore). They do have some used Jaguars at the Land Rover dealer but it’s no longer an actual dealer. If Greystar’s latest proposal moves forward looks like we’ll be losing two more dealerships. Quite the project — looking forward to next weeks post! Thanks for another very interesting and informative post. We thoroughly enjoy reading them every week. An interesting note, Redwood City was first called Embarcadero, then Redwood Landing, Mezesville, and finally Redwood City. The reason it changed from Mezesville to Redwood was because Simon Mezes made the squatters living on his land pay for their lots or he made them move. The ones who could afford to pay for the land were resentful and eventually moved to have the name changed to Redwood City. BTW, I have about 9 pages of what I call “Fun Facts” about Redwood City. If you’re interested in them, let me know and I’ll send them to you. An example: Bela Lugosi, the actor most famous for his role as Count Dracula, was married in Redwood City on July 27, 1929. His granddaughter is writing his biography and has been in touch to ask for details about the marriage that she read about in an article in the Daily Journal. I directed her to the San Mateo County Recorder’s Office where she was able to obtain a copy of the marriage license. I would definitely like to see your “fun facts”! If they are in electronic form, just send them to greg@walkingredwoodcity.com. Thanks!